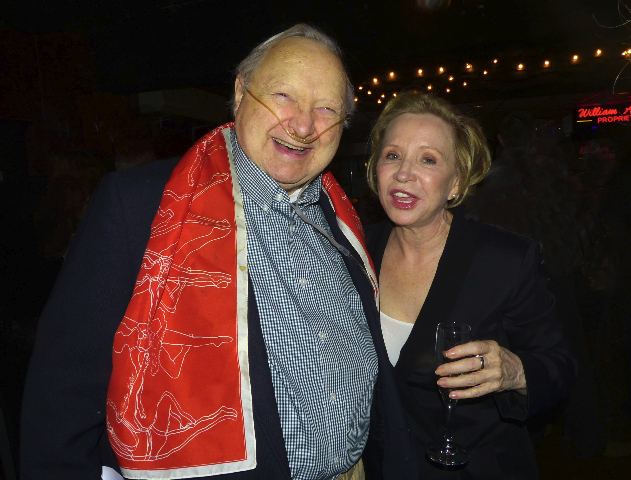 For the evening of theatre awards that ne organized in 2016 the late Larry Murry was ain high spirits with Debra Jo Rupp. Giuliano photos. 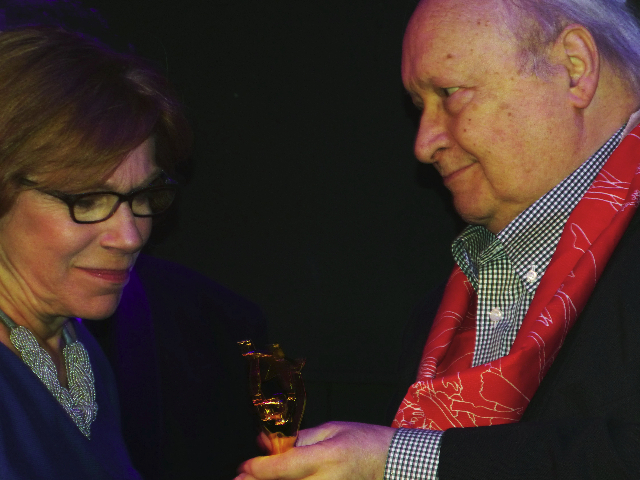 Larry presenting the award named for him to Julianne Boyd in 2016. Joel Ripka took home the award for Outstanding Solo Performance in Chester Theatre Company’s production of Duncan Macmillan’s Every Brilliant Thing, directed by Daniel Elihu Kramer. That production was also honored as Outstand New Play of the season. The Oldcastle Theatre Company production of Shipwrecked!... directed by Eric Peterson, won for Outstanding Ensemble Performance for actors John Hadden, David Joseph, and Carla Woods. Nominees: Joey Collins - At Home At the Zoo - Berkshire Theatre Group; Mark H. Dold - This - Barrington Stage Company; Carson Elrod - Taking Steps - Barrington Stage Company; Rocco Sisto - The Birds - Barrington Stage Company. Nominees: Riccardo Hernandez - The Clean House - Williamstown Theatre Festival; Randall Parsons - Arsenic and Old Lace - Berkshire Theatre Group; Brian Prather - Ragtime - Barrington Stage Company; Kristen Robinson - Company - Barrington Stage Company. BerkshireOnStage.com. Before Larry passed away in March 2017, he appointed the current board: J. Peter Bergman (President), Robert Bruyr (Secretary), Ed Sedarbaum (Treasurer), Gail M. Burns, Gloria Miller, and Macey Levin. We were formally incorporated as a 501(c)(3) non-profit organization on April 24, 2017, and added Robert Sugarman and Sally Sugarman to the board bringing in representatives of Vermont to our Massachusetts and Connecticut group. We hope to find a New York State critic to add to the board in 2018.